Usually it’s the other way around: the coach holds back a player on doctor’s orders. With Kevin Knox, however, David Fizdale went against his own recommendation and activated the rookie for Monday’s game against the Bulls. WASHINGTON — Four observations from the Knicks’ 108-95 loss to the Wizards in the nation’s capital that dropped them to 3-7 after 10 games. 1. Demoted backup Enes Kanter racked up a bullish 18 points and 14 rebounds in 24:16 but still got pulled for rookie Mitchell Robinson with 5:36 left of a six-point game…. The Knicks went with a remarkably young starting lineup, but a foul by Emmanuel Mudiay set Zach LaVine up for a game-winning free-throw in overtime. 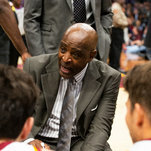 Asked to fill in after the firing of Tyronn Lue, Drew caused a stir by rejecting the interim label. Now he is simply their head coach. Despite clutch game-tying shots by Allonzo Trier and Emmanuel Mudiay, Zach Lavine hit a free throw with 0.2 seconds remaining in double overtime as the Knicks lost to the Chicago Bulls 116-115 on Monday. 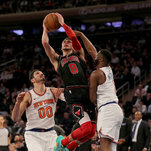 Knicks rookie forward Kevin Knox scored two points and played five minutes in Monday’s double-overtime loss against the Chicago Bulls in his first game back from a sprained ankle. After losing to the Wizards on the road, the Knicks look to regroup when they face the Bulls on Monday night at Madison Square Garden. It’s a worthwhile question as to whether the Knicks’ best course of action is to keep Tim Hardaway Jr. around during the rebuild or cash in on his value right now and go even younger. Allonzo Trier is beginning to have the league take notice of him after going undrafted. So depressing. Only Z-man and the Zionists are happy (sounds like name of a music band). Got no defense for Frank other than his defense. Send him to the G league for a month and tell him he needs to put up 20 fga/game to return. Offense looked so stagnant at start. Almost no PnRs, no set plays. Is this on Frank or the coach? The camera showed Fiz talking up a storm at the end during timeouts. Given what happened after the timeouts, wouldn’t “Give ball to Zo, anything you want” have been sufficient? Remember how bad the team looked after KP’s injury which was proof that KP is a very good player? Is this true of Timmy then or maybe KP’s not so great? Very depressing to think about. I watched game at gym on the elliptical. I couldn’t stop exercising to watch or the attached TV screen would have died. I was so rooting for game not to go into overtime. By the end, even the refs were eager to get outta there and head to a nice restaurant when they called that foul. And I felt like I had just ran a marathon through the Gobi desert. I hope tomorrow morning I wake up a lot happier. I’ve been as much a Frank optimist as anyone, but he was really terrible last night. Defense was ok I guess but talk about having zero impact on the offensive end of the court. Even as the supposed PG on the court, he just gives up the ball after crossing half court and runs to the corner. Is that what he is being told to do? I actually didn’t think Mudiay looked so bad. Offense was about the same as usual although it seemed he didn’t fall down quite as much as usual, but I think I actually saw him get over screens last night on defense as opposed to dying on them every time. A reminder that they were in the second game of aback to back and missing their best player. That’s not to say Hardaway is an all star but this is a super young team that isn’t that good or experienced to begin with and then you take out Hardaway who accounts for about 24 points a game for them. Is anyone really that shocked? Another reminder: Frank is still the same age as Mitch Rob. He’ll probably never be a great offensive player, but he still has plenty of room to grow, especially as a pg.